It is a shame that the world's largest uncut diamond, which was expected to sell for more than £52 million at Sotheby's last month failed to make its reserve price, the highest bid being £45 million. The rough diamond, of 1,109 carats and believed to be more than 2.5 billion years old is the Lesedi la Rona, almost the size of a tennis ball, which was unearthed in Botswana in November at the Lucara Diamond Mine Corp's Kaowe mine. The Lesedi la Rona which means "our light" in the Tswana language, wasn't the only big gem discovered that week - two other huge diamonds were found from the same mine within 72 hours, a 374 carat diamond which hasn't been named and an 812.77 carat diamond called The Constellation. I'll bet the company is pleased that it installed six TOMRA electronic sorters last May (posting of 27 November 2015), which recovered these huge stones prior to crushing. 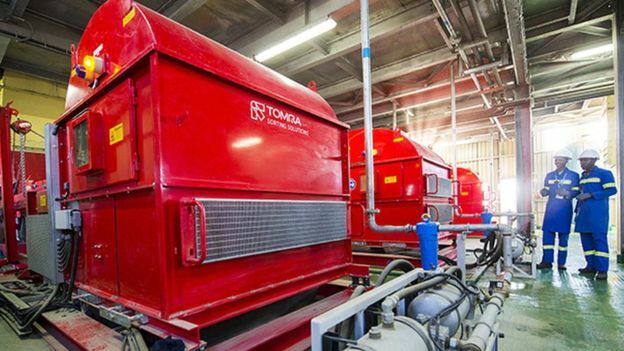 The TOMRA XRT sorters replaced conventional Dense Media Separation technology in the -60+8mm size range. Each sorter can treat up to 150 tons per hour at over 8,000 hours per year. There is no need to further process the sorter’s concentrate before final hand sorting, and congratulations to Tiroyaone Mathaba who was sorting when he spotted what turned out to be the 1,109 carat diamond. His boss William Lamb said that all of the mine's 804 employees and contractors received a bonus, but he didn't reveal how much. A further congratulation to Lucra- as part of the plan for the auction at Sotheby's, the company put 3 small stones up for sale, fetching a total of US$104,000 for charities in Botswana. How grinding circuits have changed! 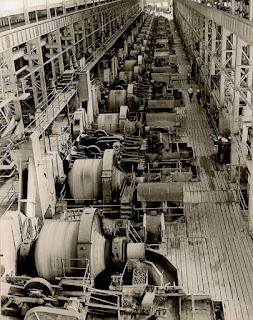 Tim Napier-Munn emailed me earlier in the week with this remarkable photograph of roughly one half of the line of 28 ball mills in closed circuit with rake classifiers at the Mufulira copper mine, Zambia, in the 1970s. The concentrator treated 20,000 tpd, which makes about 30 t/h per mill but that’s without circulating load. 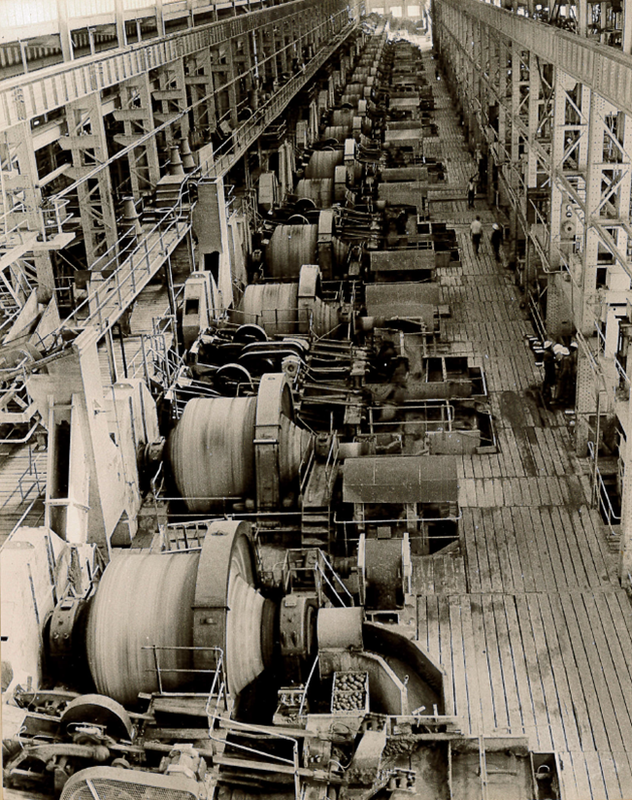 Tim asks if anyone remembers the total throughput of each mill including the circulating load. The current largest mill in the world (AG) treats 1350 t/h of hard ore so basically Tim is trying to assess how many of these small mills this is equivalent to. Although he realises that it is probably not fair to compare ball vs AG and medium hard vs hard, he is trying to make a point about how much increase in scale there has been in our professional life time. Peru is a great mining country, the 3rd largest copper producer next to Chile and China, the huge recent boost in production being likely to lead to the country overtaking China this year as the 2nd biggest producer. Peru is also the 3rd largest producer of silver, zinc and tin, and the 4th largest molybdenum producer. Recently it passed South Africa in the league table for gold, and is now the 5th largest gold producer. The mining boom has also seen the growth of Peru as a major conference venue, and this year MEI is a media partner to three major mineral processing events in the country. Last month, Flotation Peru was held in Lima, unfortunately clashing with our own conferences in Falmouth. In August Metallurgy Peru will be held in Lima, and in November Comminution Peru will also be in Lima, and hopefully MEI will be represented there. 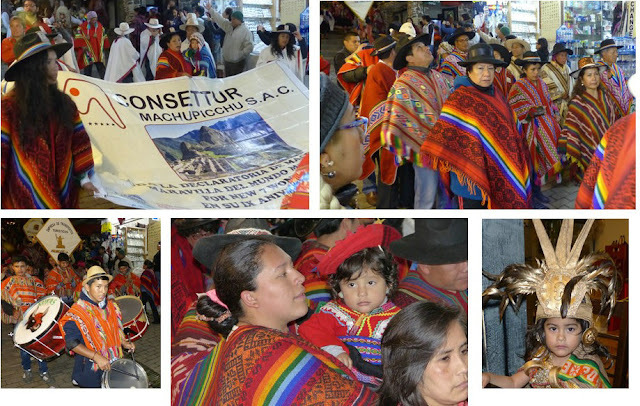 But it is not only mining which makes Peru such an attractive country to visit. It also has a fascinating history, that spans thousands of years and countless civilisations, from 2000 BC to the bloody conquest by the Spanish in 1535, which has left the Peru of today with a myriad of fascinating ancient sites. Barbara and I spent a week there earlier in the month, and I hope that our photos and itinerary, organised with the excellent Audley Travel, will inspire others to visit this beautiful country. We arrived in Lima late afternoon yesterday after a 12 hour flight from Madrid, and spent the night at Wyndham Costa del Sol Airport Hotel. This morning we took the short flight to Cuzco, arriving mid morning, where we were met by Silvia, our guide for the next few days, who accompanied us to our beautiful small boutique hotel, the restored 18th century adobe Casa San Blas. We spent a leisurely afternoon strolling around the historic district of the city, acclimatising to the 11,200 ft (3400m) altitude. Having suffered from bad altitude sickness 20 years ago, skiing at 12,000 ft in Chile, the lesson I have learned is to take it easy for a day or two before indulging in any strenuous activity! 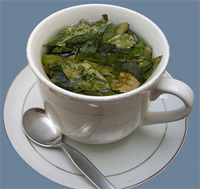 We also had our first taste of coca tea, an infusion of raw coca leaves, said to alleviate the symptoms of altitude sickness. This morning Silvia took us on a tour of Cuzco, the capital of the powerful Inca Empire in the 15th century. Designed in the shape of a puma, its important buildings were constructed from volcanic rock and decorated with gold. When the conquering Spanish arrived in the 16th century they stripped the city of its treasure and built their own city on the solid Inca foundations, such that today nearly every street reveals Inca walls, arches and doorways. Just outside the city, we explored the 11th century Inca ruins of TamboMachay, Kenko and Sacsayhuaman. Particularly impressive was the Inca ceremonial centre of Sacsayhuaman, consisting of zigzag terraces and ramparts 300 metres in length. 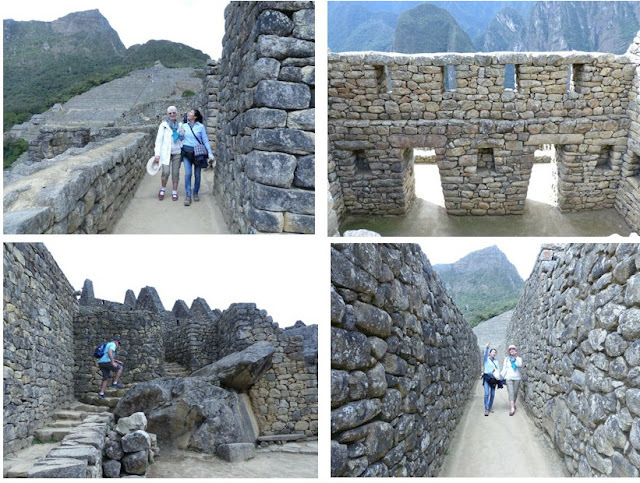 As with many Inca constructions the walls are made of massive, irregularly shaped limestone boulders that fit together like a jigsaw puzzle without the aid of mortar, a testament to the amazing skills of the early Inca builders and stonemasons. A wonderful day in the beautiful Sacred Valley of the Incas. This picturesque valley between the towns of Pisac and Ollantaytambo was at the spiritual and commercial heart of the Inca empire. 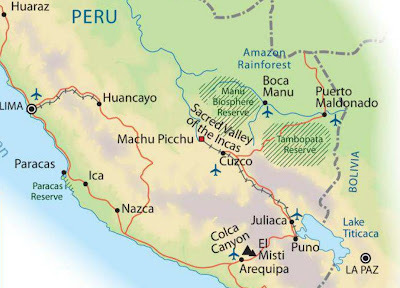 It is part of a long river valley that starts upstream of Cuzco in the south, continuing into the jungle before the Urubamba River merges with other Amazon tributaries. The valley lies to the northeast of Cuzco, and is guarded throughout by ancient Inca citadels set high on the hillsides and, in particular, the Inca fortresses of Pisac and Ollantaytambo, which stand watch at either end of the valley. The impressive agricultural terraces at Pisac, which were laid down by the Incas in the early 13th century, are still in use today. The terraces enabled the production of surplus food, more than would normally be possible at altitudes as high as 11,000 feet. With military, religious, and agricultural structures, the site served at least a triple purpose, Pisac defending the southern entrance to the Sacred Valley and the fortress at Ollantaytambo the northern. After exploring the ruins we spent some town in the colourful market town of Pisac, then set off for Ollantaytambo, stopping off for take-away roasted hamster en route, which formed a starter for our lunch in Ollantaytambo! 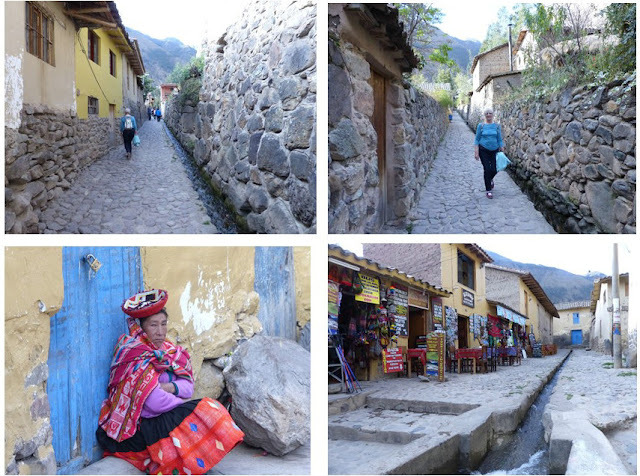 At Ollantaytambo we made the long climb up the terraces to the ruins of the military fortress to look across to the Inca grain store-houses and to look down on the town, which dates back to the 15th century and has some of the oldest occupied dwellings in South America. We stayed overnight at the attractive Hotel Pakaritampu in the town. An early start for the 7.45 am train to Machu Picchu, a journey of one and a half hours alongside the Urubamba River and through lush cloud-forest vegetation to the town of Aguas Calientes. From here it was a 25 minute bus ride on a steep winding mountain road up to the 15th century citadel of Machu Picchu. According to TripAdvisor this is now the world's most iconic place and the view on entering the complex is stunning, no matter how many times one has seen photographs of it. For many centuries this magnificent site was hidden, buried in the jungle which had encroached upon it since the Incas deliberately abandoned the city before its final completion. It remains a mystery as to when or why they deserted their mountain-top home. There are various theories, such as the inhabitants succumbing to diseases such as malaria and yellow fever, which would not have afflicted the high altitude inhabitants of other settlements, such as those in the Sacred Valley, Machu Picchu being at 2450 metres and in the more humid cloud-forest. 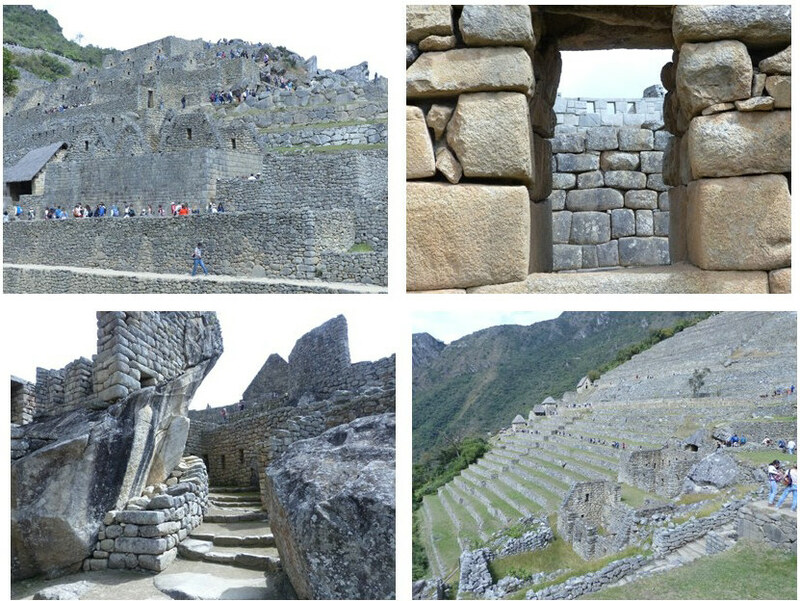 Although the Conquistadors never found Machu Picchu, to loot and destroy its treasures, they did so elsewhere, so it may have been that Machu Picchu became cut off from its supply of food, forcing the inhabitants to leave. Although never a lost city, as it was occasionally visited and inhabited by local farmers, the American explorer Hiram Bingham stumbled upon the Inca citadel in 1911. An archaeological team from Yale University was then sent to unearth this stunning find, and what they discovered was an amazingly intact settlement, home to around 1000 inhabitants, as well as terracing on the steep hills, highways and satellite sites. Our guide Silvia informed us that the site is likely to be closed to the public in 5 year's time, due to the damage caused by the 1 million visitors each year, so that in future tourists may be restricted to viewing via platforms, and will not be free to wander at will around the old city, as we did today for 3 hours. 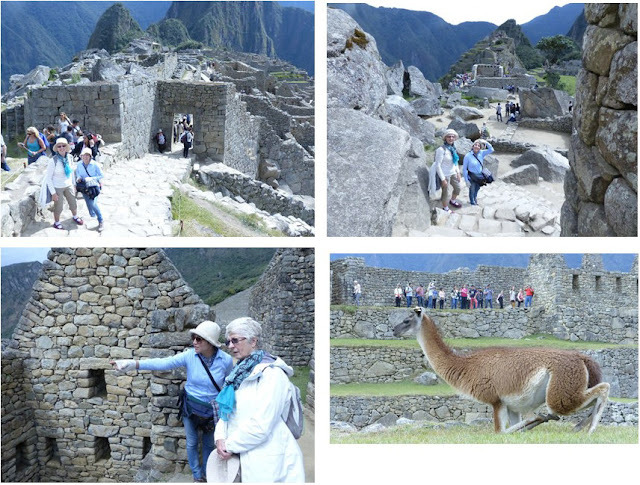 After lunch and a brief rest, Barbara and I took the steep, and sometimes exposed, trail to the Inca Bridge, often referred to as a “secret entrance” to Machu Picchu. The Inca Bridge is a narrow path that winds along the side of the mountain with very little between you and a 580m (1,900ft) drop. At the end of the accessible trail is a 6m gap that was designed to be bridged by tree trunks that could be discarded to make the bridge impassable to outsiders. Returning to Machu Picchu we had a 30 minute wait for the bus down to town, where we stayed overnight at the El Mapi hotel, where, after a very good dinner, we were lucky to be able to join in the carnival atmosphere, the annual celebration of Machu Picchu - a true wonder of the world! 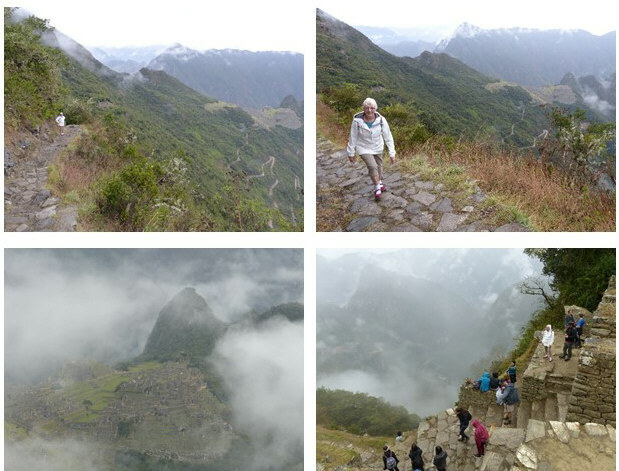 A cool, very wet morning today, so we took the bus back up to Machu Picchu from where we hiked for an hour up a gentle incline to the Sun Gate, the Inca entrance to the citadel, and now the end of the tourist Inca Trail, marvelling at the fact that the paving stones we were walking on were laid down around 500 years ago. After our soaking we took the train back to Ollantaytambo where our driver was waiting to take us back to Cuzco, high altitude, and the requisite coca tea! A long train journey today from Cuzco to Puno, on the shore of Lake Titicaca, which straddles Peru and Bolivia, and at 3860 m (12,420 ft) is the world's highest navigable lake. 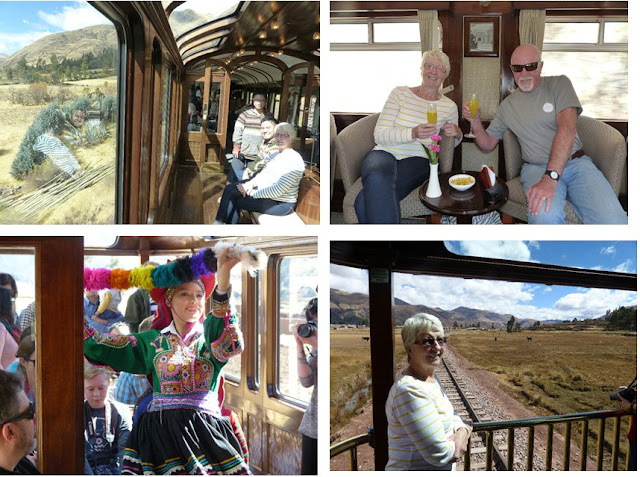 This was a great day, as the Andean Explorer was the most luxurious train we have ever travelled on, reminiscent of the Orient Express. And all the way we were treated to fine food, and entertainment from Peruvian singers and dancers, as the train clickety-clicked its serene way through the beautiful Andean landscape. The highest point of the journey was the La Raya Pass at 4321m (14176 ft), and a 10 minute stop to stretch the legs and buy a few souvenirs from the local people. 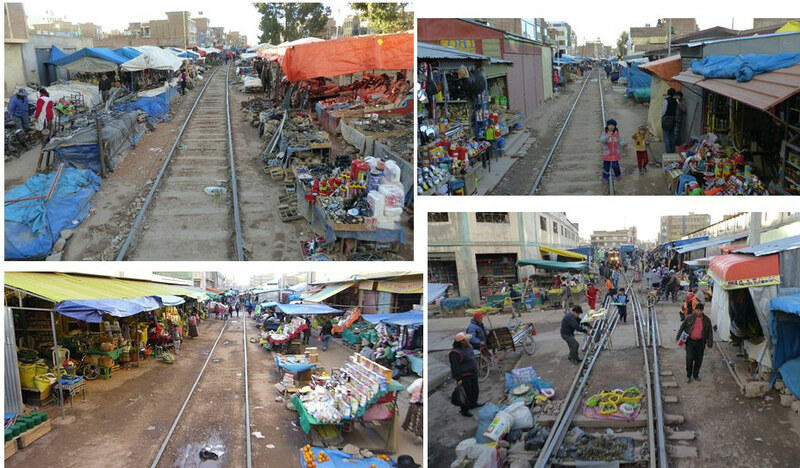 From the train's observation carriage we were treated to a variety of vistas, snow-capped mountains, flat open planes and fascinating crawls through the centres of towns and villages, including an amazing passage through the sprawling, unattractive city of Juliaca, where vendors displayed their wears along, and sometimes between, the railway lines and children ran behind the train waving to the inhabitants of another world (see also YouTube Video). After 10 and a half hours and shortly after nightfall, we arrived at Puno, where we stayed at the Tierra Viva Puno Plaza hotel. A full day today on Lake Titicaca. More that 25 rivers empty their waters into the lake, the largest, the Ramis, draining about two-fifths of the entire Titicaca Basin, enters the north-western corner of the lake. One small river, the Desaguadero, drains the lake at its southern end. This single outlet empties only 5 percent of the lake's excess water; the rest is lost by evaporation under the fierce sun and strong winds of the dry Altiplano. This was evident from the clear blue skies this morning and the heavy clouds which built up in the afternoon. We left Puno by boat early in the morning and headed for the Uros, a group of around 45 artificial islands made of floating totora reeds, which abound in the shallows of the lake. We stopped off at a small island, inhabited by five families, who earn a meagre living from fishing, crafts and tourism. It was interesting to see that most of the dwellings had solar panels, which powered their TV sets, where soap operas and football were particularly popular. Many of the children had the European first names of their popular TV stars! From the Uros islands we sailed on to the Capachica Peninsula and walked up to the tiny village of Llachon, had lunch in a local house and observed the locals going about their daily business. Then it was back to Puno, and the end of our truly fascinating few days in Peru. The following morning we were driven to Juliaca to take the plane to Lima, where we started our tour only a week ago. 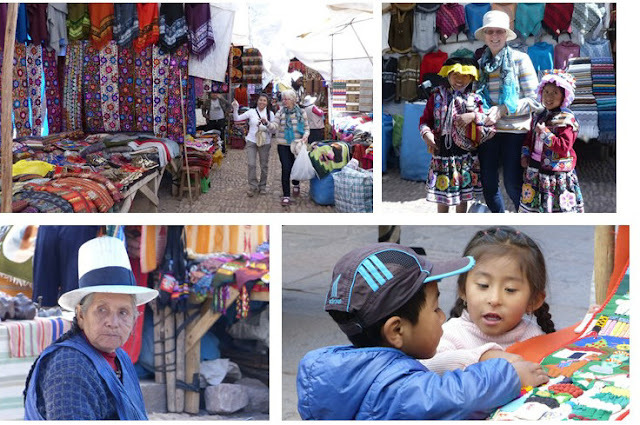 In summary, Peru has been one of our greatest travel experiences. We would not have missed this for the world and in our short stay we have seen wonderful things, magnificent Andean scenery and very friendly people with an interesting culture and history, and I would strongly recommend this itinerary, which was put together by the faultless Audley Travel according to our specified requirements. A special thanks to Alex Higgins who organised this with us, and to our wonderful, knowledgeable guides, Silvia and Romulo and our driver Teofilo who negotiated us through some horrendous traffic in the narrow streets of Cuzco. I hope this travelogue will be of value to any of you visiting Peru for the first time, maybe to attend a conference in Lima, and I would particularly appreciate comments from those of you who know Peru, if only from brief visits. It would be very interesting to have your views on this wonderful part of South America.